Ignoring protests from China, the Dalai Lama’s week long visit to Arunachal Pradesh begins from Today. However due to bad weather condition there is slight Change in the Schedule. 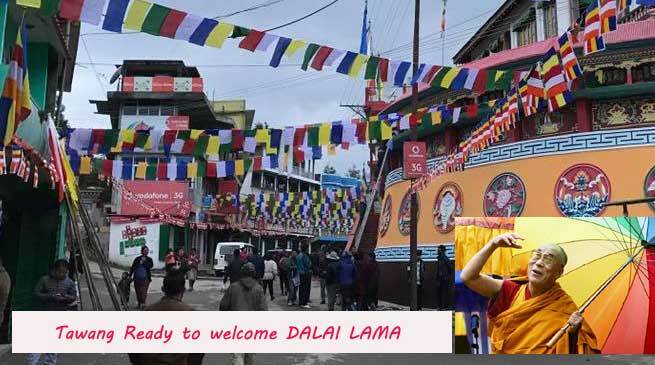 Now the Dalai Lama to visit Bomdila first and then Tawang. As per the existing contingency Plan the Dalai Lama’s is visiting Bomdila in West Kameng first and then Tawang. The change in schedule was incorporated due to unavoidable circumstances of bad weather wherein the chopper service couldn’t be availed to fly to Tawang. The Dalai Lama along with his entourage accompanied by the CM of Arunachal Pradesh Pema Khandu left Tezpur to West Kameng in Arunachal Pradesh today morning by road. The Dalai Lama’s visit to Arunachal Pradesh this week comes eight years after his previous visit, which was given the green signal by then Prime Minister Manmohan Singh. The spiritual leader’s visit to Tawang in 2009 came exactly 50 years after he had passed through the town on his way from Lhasa in Tibet to India. The Tibetan spiritual leader fled from Tibet after a failed uprising against Chinese rule in 1959. He now lives in exile at Dharamshala in northern India.